Jurys Inn Manchester has unveiled its brand new look following an extensive £2.9 million transformation. The hotel welcomes a stylish contemporary new look with new open plan lobby with self-check in services, 265 spacious bedrooms and a new bar and restaurant ‘Oddsocks Bar & Kitchen’. 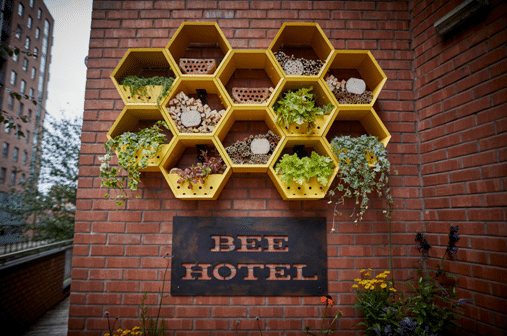 Jurys Inn Manchester has also launched its ‘Bee Happy Hotel’ that will house honey bees, Manchester’s iconic symbol, during the hibernation season. As one of the UK’s cultural hubs, the hotel offers two fully equipped, modern meeting spaces perfect for presentations and training sessions. The meeting rooms can accommodate up to 50 people theatre style. The new bedrooms are finished with vibrant interiors, modern decor and unique art reflecting the local Manchester textile industry. Bright and inviting, each room comes fully equipped with free high speed WiFi, a spacious en-suite bathroom, a 42 inch flat screen TV with Freeview, hairdryer and complimentary toiletries. Each bedroom also now features the exclusive DREAM bed by Jurys Inn, designed to offer unparalleled levels of comfort and ensure the perfect night’s sleep. Jurys Inn Manchester also offers 13 executive bedrooms. Oddsocks Bar & Kitchen is the latest addition to the recently refurbished Jurys Inn Manchester, reflecting the eccentricity of Manchester with an eclectic mix of convenience and quirkiness, comfort and charm. The hotel also has a stylish new lobby with a dedicated connectivity area and plenty of space for informal meetings. It will also be the first Jurys Inn hotel to trial self-check in allowing guests to check in using new kiosks in reception. Jurys Inn Manchester is looking into additional technology upgrades for the future including online check in and cardless room access using a mobile phone to open the bedroom, creating a seamless stay for business guests. The Bee Hotel has been designed with consultation from the Manchester and District Beekeepers Association (MDBKA), to help prevent the decline of the Manchester bee population. MDBKA President Lena Crowe stated; “We are thrilled Jurys Inn has provided a city-centre bee hotel to help sustain the honey bee population in Manchester. For more information on Jurys Inn visit www.jurysinns.com/hotels/manchester.